Media in Taiwan have reported 11 people died and more than 500 were injured. A New Hampshire man injured in a deadly Taiwan powder explosion is telling his harrowing story. Alex Haas was in Taiwan teaching English to kindergartners. After several months in the hospital, he finally was well enough to fly back to the United States, heading straight to Massachusetts General Hospital. Wednesday, he was back home in Mont Vernon where he recalls that horrifying night. "It was instantaneous, the fire was just there," Haas said. He was at a concert called Color Play Asia in New Taipei when the colored powder ignited into a raging cloud of fire. "Anywhere where there had been dust in the air, there was fire," he explained. "It's really terrifying, like you can't breathe." Twelve people died and more than 500 people were injured. Haas was on fire for 60 seconds and suffered burns on 90 percent of his body. "Not just second, but deep second and third degree burns all over," he said. His parents flew to Taiwan right away where doctors gave them little hope of their son's survival. "They pretty much told us he wasn't going to make it," said his mom, Leslie Haas. In the days after the June 27 explosion, support from family, friends and complete strangers came pouring in. "Hundreds of thousands of people all over the world just saying, 'Come on, Alex, you can do it, come on, Alex, you can do it, you can get better,'" Haas explained. That, plus the heartfelt visits and cards from his young Taiwanese students kept him fighting. "I would like to think I am a tough guy but I couldn't say that and feel right because the support just gives you that extra push when you need that extra push," Haas said. 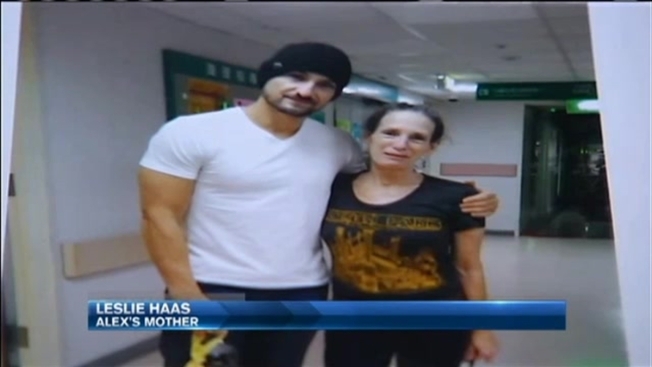 A GoFundMe page has raised more than $100,000 for the Haas family for medical bills and their two-month hotel stay in Taiwan. Haas says he feels lucky to be alive. His mom though, says luck has nothing to do with it. "It's just a miracle, that's all that's the only word to describe what's happened to his family," she said. "I believe in miracles, I definitely believe in miracles, because he is one." Haas says there is truly no place like home, but he misses his students in Taiwan. He says once he is fully recovered, which could take up to two years, he will definitely go back.